You can buy your match day tickets online or at the stadium. It’s most convenient to buy them at the stadium right before the match. I only recommend buying them online in advance if they’re playing a popular team. If you want to see more of the stadium, you can take stadium tour in the summer. You could almost walk right past the Stade Louis II without realizing it’s a stadium. The stadium gets its name from Prince Louis II of Monaco. He was the prince of Monaco in 1939 when the original stadium was built. It’s located in Western Monaco and it takes 20 minutes to walk there from the train station. Because Monaco is one of the smallest countries in the world you can walk to the stadium from anywhere in the country. If you walk west of the stadium you’ll be in France. 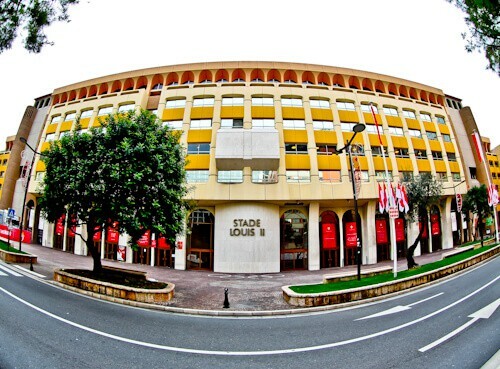 The Stade Louis II is the home of top French team AS Monaco. 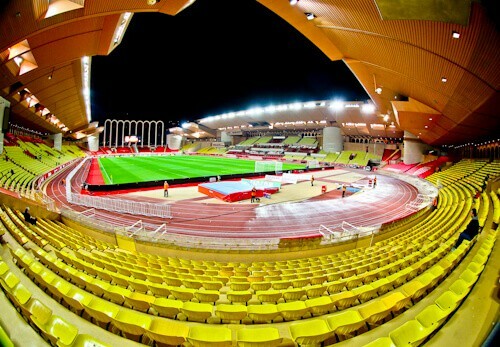 It’s also the home of Monaco national team and athletics events are held here too. The capacity of the stadium is over 18,000. This means that half the population of Monaco could fit in the stadium. The IAAF Diamond League have a meeting here annually. There are guaranteed to be some world class athletes here for the meeting. In 2017 Usain Bolt won the 100 m in the Stade Louis II. Half of the population of Monaco did come to the stadium to see Bolt race! Bouba the mascot entertains the fans during the pre match build up. 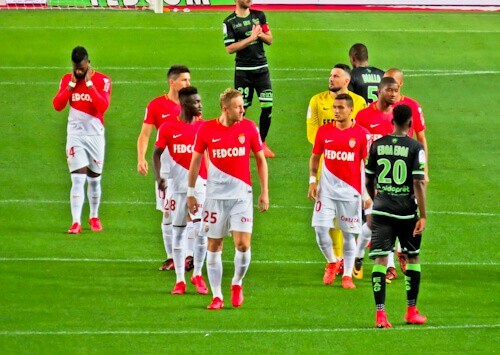 Bouba wears a Monaco shirt with number 98 in honor of the royal family of Monaco. Their post code is 98000. 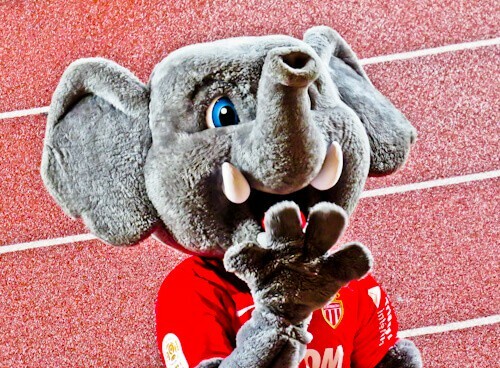 If you’re going to watch the game with kids they’ll love Bouba the elephant. He will come close to the stand so you can get a selfie with him. All the fans in the stadium get excited as the teams walk out. 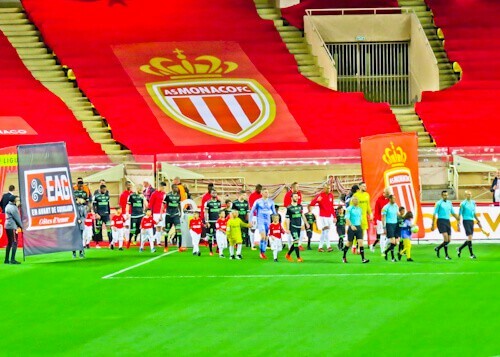 The AS Monaco team is guaranteed to be full of stars. The teams will come out with their mascots (young children). Many kids dream of watching a professional football match. If you know in advance you will be watching a match you could email and request your child gets to walk out with the players. As the stadium can hold up to half the country, it’s rarely full. Would half of England turn up to watch Manchester United? The answer is no, never! There is a group of fanatics in the Monaco home supporters stand. There is the lead fanatic, who stands on a podium and chooses which song to chant. During the match I watched, there were around 30 fanatics in this group. I’m sure there are more when they are playing in the Champions League or against Paris SG. The €10 ticket gains you access to the Monaco home fans section. 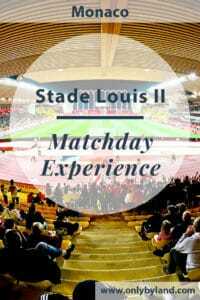 If you choose this ticket then you’ll be able to watch the AS Monaco fanatics as part of your matchday experience. When I visited, AS Monaco were reigning French champions. The match I watched was AS Monaco vs Guingamp FC. The star I wanted to see was Colombian, Radamel Falcao. Unfortunately he was not playing but AS Monaco still won the match 6-0. Brazilian international defender Fabinho was playing and actually scored. There is a regular train from Gare de Nice-Ville to Monaco Monte Carlo. This service takes around 30 minutes and costs less than €8 return. 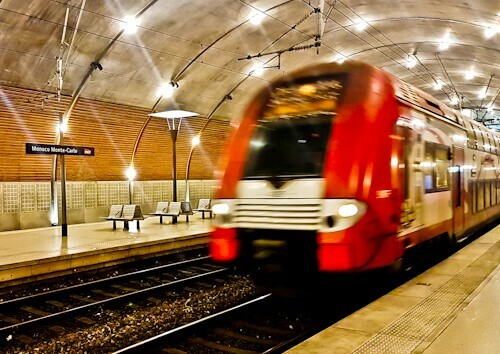 Stade Louis II is a 20 minute walk from the station. If you are already in Monaco you’ll be able to walk to the stadium from anywhere in the country. Monaco is one of the smallest countries in the world. How to enjoy a matchday experience at the Allianz Riviera in Nice. What to see and photograph in Monaco. I’m in Monaco this week and they are at home to Rennes. Thanks for writing this article – it’s helped me a lot and I will definitely go see this match with your help! I’m going for the 10 euro seat with the Monaco fans! Enjoy, let’s hope it’s another 6-0 goal feast! Half the population of Monaco can fit inside this stadium?! Wow, I never knew Monaco was that small, just filthy rich and expensive!! I can see why you could walk past the stadium and not think it’s a stadium, it looks small from your photos. Loving the mascot Bouba, I’m sure it adds to the match energy! Don’t need to be a guy for enjoying reading your post! A girl can be a soccer fan too! We are driving down to the Marseille next summer so I will make sure to take the route that pass by Monaco and I will visit this stadium! My daughter wouldnt appreciate the visit but perhaps she will like the team mascot Bouba! Monaco is that small yet looks so beautiful. The stadium is sure small and I think it’s perfect for me. I’d not like to have too many people around, then not see the players. I think it’s chic. And the railway looks beautiful too. It would have been magical to have been here the same night as Usain Bolt – the atmosphere must have been incredible! I think I’d prefer to watch athletics over football but who wouldn’t enjoy watching the French champions play! I’d try get there for a Champions League match. 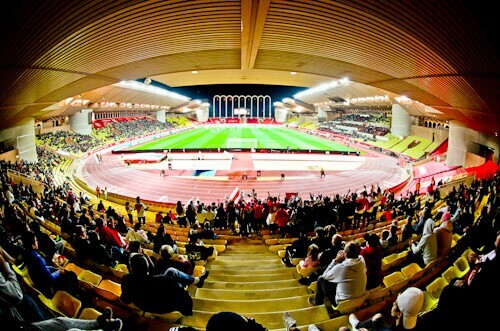 I am a huge athletics fan, I am going to investigate visiting Stade Louis II for the Diamond League meet. It’s a shame Usain Bolt has retired but still the 100 m is fun to watch! If not, watching the French champions play sounds fun and which female doesn’t enjoy watching Falcao? Hi Sammy. It’s such a convenient stadium for watching the athletics. As it’s a short train ride away from Nice you can stay in good value accommodation and not have to worry about parking. The trains between the cities run frequently and until late too. No comment on Falcao! Not a great fan but had no idea that Stade Louis II is the biggest stadium in Monaco. Nice to know that the stadium can hold half of the country. Would love to visit when we plan a trip to Monaco. I am sure my husband will love the place. That’s incredible that the stadium can hold up to half the country! I’m not a huge of paying to watch organized sports because tickets can get to be so expensive, especially in the United States. Would love to hear more about money saving tips you have for tickets if you have any!